I feel like Dipper Pines sometimes. Bearing witness to strange, otherworldly things with no one there to believe them. The thin scratch across my forehead from laughing at the occult. The shadowy figure seated in the living room. These stories and more are unbelievable to most, to the point where explaining them rings hollow even to me. But there are some things Dipper and his twin sister have seen that even I can’t believe, making Gravity Falls one of the most intriguing shows on television. Explaining the unexplained is a difficult task. But explaining why Gravity Falls is so great? That’s easy. 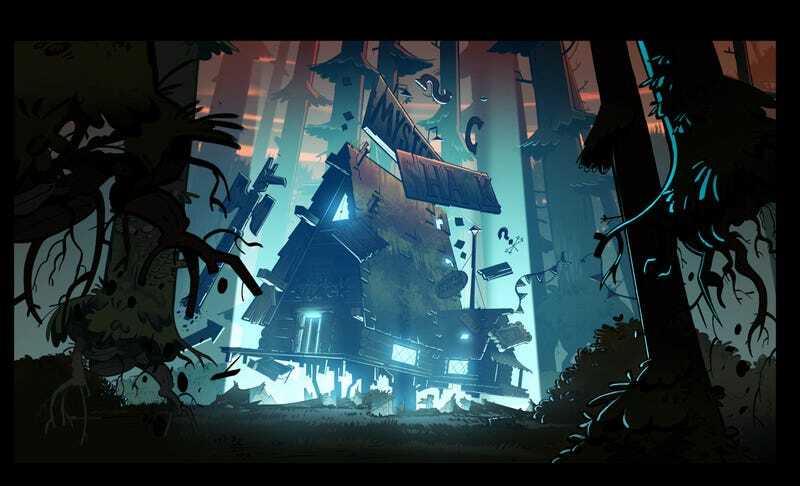 Gravity Falls is often described as the children’s version of The X-Files meets Twin Peaks. 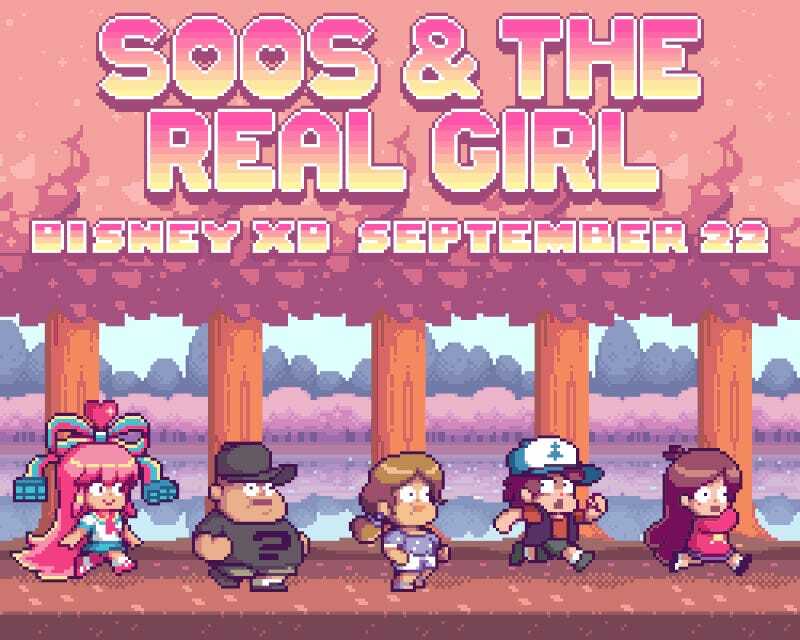 That’s not entirely inaccurate: Dipper and Mabel Pines are sent to Oregon to spend the Summer with their con man and cranky Great Uncle Stan (Grunkle Stan) who lives in Gravity Falls. They quickly realize that the town is home to actualized myths, legends and supernatural occurrences. Gravity Falls stands apart from those iconic shows in a few ways, with its own flavor and identity. Arguments for why adults should watch series seemingly targeted at kids alone usually boil down to: “...because they have adult themes”. Shows like Adventure Time really do appeal to the masses for a variety of reasons, packaged in the colourful shades of animation as the medium to tell those stories. In Gravity Falls’ case, that reason is true here too: it’s smart enough for older crowds to understand. The series, created by Alex Hirsch, uses clever dialogue, and comedy to tell engaging stories, which are both absurd and undeniably human. Characters falter and learn, all the while grounded in surprisingly heavy sci-fi and fantasy plots. The show manages these themes with the help of preteen twins, Dipper and Mabel voiced by the extraordinary talents of Jason Ritter and Kristen Schaal, respectively. The twins are relatable to kids and adults alike, in that they suffer growing pains which we’ve all experienced—first loves, crushes on older kids, and other uncertainties in changing relationships, and insecurities from growing older. Dipper is the awkward, astute child burdened with being too smart. As daily anomalies surface in Gravity Falls, he becomes a conspiracy theorist. As most of the supporting cast either experience the supernatural with Dipper, or at times just don’t see things, Dipper’s obsession manifests in trying to unlock all of Gravity Falls secrets. He’s not too interested in proving much to his peers but he is focused on validating his finds and his worth to those in authority—first to the government and on a national scale, and later by seeking approval from his genius Uncle. Mabel is the preteen girl infatuated with boys, and more easygoing than her brother. Her other interests involve a Bedazzler, cute things, and she’s also the owner of the most wacky and cool collection of sweaters to ever grace this earth. She’s Dipper’s partner in exploration, and is part of the reason why Dipper doesn’t really seek approval from others. Despite being polar opposites—Dipper ruled by rational thought and Mabel ruled by emotion—the twins are siblings who exists as best friends. They work together more than apart, and when they’re at odds, it’s always based in a lesson that relates to a wider narrative arc. Gravity Falls recently ended a plot line that solved the biggest mystery of the show’s run. The result was the addition of a new, important cast member whose presence has the potential to strain Dipper’s and Mabel’s friendship. His appearance carries with it possible foreshadowing, and juxtaposes the Twins’ own relationship with his—a possible future reflection of history repeating itself with siblings in opposition, despite the seemingly unbreakable bonds which twins share. As the Pines twins grow with their difference in interests and personalities becoming more apparent, the show has potential to be even more gut-wrenching. Gravity Falls’ foundation lies with Dipper and Mabel’s relationship with each other and with their Grunkle Stan—it’s most emotional, and at its best when stories revolve around them. Subtle, changed relationships are creeping in to fracture that foundation, and it’s exciting and daunting to think what evolving stories and heartache lie ahead. While it began as two kids discovering Summer with their eccentric Grunkle Stan in an even more eccentric town, Gravity Falls has proven that its supernatural entities are no more vital to its mystery than its young protagonists’ interpersonal relationships. Their growing pains are applicable to the fears no one grows out of, and are the fears we latch on to even as adults. Dipper and Mabel are young enough to be hit by real questions and situations that require their personalities to change, develop and be molded by their experiences. Old enough to be enraptured with cautious curiosity by all the secrets Gravity Falls holds. Daring enough to challenge the mysteries of this bizarre town. And what a bizarre place. Gravity Falls is a stomping ground to every kids’ worst nightmares come to life, but often warped with a charming weirdness. Gnomes, The Undead, Zombies, Minotaurs, Ghosts… these are just some of the things which inhabit Gravity Falls’ world. They’re often surprisingly whimsical, and not always dangerous. Sometimes the stories are unexpected and the supernatural entities have woes too, with their own social problems and class distinctions. Take the Lilliputians, for instance. They’re a race of miniature folk with golf sized shaped heads who live at Gravity Falls’ miniature golf course. They’re not all the same, with warring factions distinct as to the holes and areas they hail from and protect on the golf course—pirates from the ship landscape, Dutch from the windmill area, miners from the mining town theme—plus the shout to Gulliver’s Travels is pretty crafty too. Every creature in Gravity Falls has an abundance in creativity—from their unique behaviors, dialogue, and animations. With backstories and personalities all their own, many of the creatures in Gravity Falls, particularly those in earlier episodes, were not threatening in the very evil, scary sort of way. They were less nightmarish, and allowed Gravity Falls to build a world with lore unlike the ones we’ve come to expect from a typical horror genre. Each new monster or twist on the anomalies is a joy to experience for being so different. They create insane and often hilarious situations which the twins and company have to contend with. As the core of the show is how Dipper’s and Mabel’s relationship is affected, the writing is always sharp and focused to find the balance in making its monsters interesting but not distracting. Many of them are downright silly and fun. But it’s part of the reason why, however, when Gravity Falls brings out a truly evil nemesis for Dipper and Mabel to face, the show’s exceedingly more terrifying. It’s still a relatively young series. Each of the 34 episodes aired thus far are so complete with excellent pacing, that Gravity Falls has developed its world with care and suspense, with promising reveals to explore from both its villains and main characters alike. As special as the series’ antagonists and main characters are, every member of the quiet Oregon town of Gravity Falls feels custom made to uphold the town’s special aura. Though they’re one-note sometimes to carry a gag and their existence feels like caricatures of the town itself and set pieces within—like the monsters-of-the-week situations, they’re there to strengthen Dipper’s and Mabel’s relationships and that of the main cast. It doesn’t make them any less important or fun to watch as they’re crucial to the makeup of Gravity Falls’ curious nature. One of the greatest methods of storytelling the show engages in is the length it’ll go to in order to hide secrets to future plots. It’s in part a mystery show, and does well to scatter clues and callbacks to other episodes. Even some simple sight gags which may not mean much in one episode can mean a lot at a later time. It can have fans doing a lot of guess work and puzzle solving too, connecting viewers to the show’s mysteries as much as Dipper and Mabel are invested in finding the truth. It’s astounding at just how clever it can be—even dipping into time travel stories as complex and surprising as some of the best sci-fi stories out there. Gravity Falls treads familiar ground with stories of growing up, fantasy settings and creatures, although its approach mostly result in light-hearted fare. But as traditional as this territory is with Gravity Falls representing as every town America—its townsfolk shown to be simple, and the sleepy town is surrounded by woods giving way to a creepy atmosphere—the show is riddled with stabs at pop culture. There are video game and gaming references. Memes. Current cultural phenomena. Internet culture and self-aware humour. It expands Gravity Falls’ stories to give the traditional a more nuanced, modern feel. The jokes are almost always on point and relevant while still maintaining the show’s fantasy feel. There’s a lot of material to work with and blending these two aspects is something the show expertly achieves. Beyond that, Gravity Falls is one of the most beautifully animated shows on television. There’s a level of close detailing in all the scenes, making Gravity Falls along with its citizens, a character on its own too. Colour palettes can be dreary, tones are earthy with quiet colours descending over the town to be as atmospheric as its horror setting. It’s not all dark and gloomy though, and Gravity Falls has some of the most inviting warm colours of a very alive town with an underlying feeling that extend an unnerving, luring invitation. There’s so much to cover on exactly what makes this show so special. Individual episodes contain some of the funniest and intelligent references and writing. Character arcs and relationships are complicated and are handled with maturity that’s not sugar coated, making these moments refreshingly realistic—which is surprising for a show steeped in lore so far from reality. Gravity Falls posits that growing up is weird as is—so why not complicate the issue further by adding the weirdness of a creepy town with all its ghastly, nasty, and strange creatures to make life even more interesting? It’s nothing Dipper and Mabel Pines can’t handle, and it’s a summer I hope never ends. Gravity Falls airs on Disney XD, Mondays at 9 p.m. EDT. Full Seasons & Episodes available for purchase on iTunes, and Amazon. Updated 9/04/2015 creatures section to add The Lilliputtians.